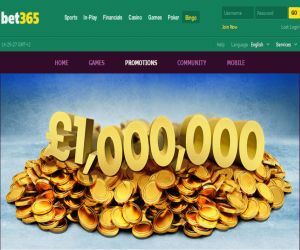 bet365 Bingo's £1m January Jackpot | Grab your Share! What with you do with your share of £1,000,000!? Luckily you don't have to wish upon a star! Simply hop over to bet365 Bingo to play daily jackpot games to see how much you can win! What better way to kick-start the new year, than with a freshly topped up balance! So make sure you turn up to bet365 Bingo each day until 27th January to grab your share of the £1,000,000 prize pot! There will be two fresh £20,000 Community Escalator Jackpots up for grabs every day! To get in on the January jackpot action, simply start playing in the Deal or No Deal Bingo 90 ball and Guilty Pleasures rooms each day, to see if you can strike it lucky! The fun doesn't stop there, as each hour the ball count for the jackpot will escalate by one until 5pm each day! It get's even better as between 28th and 31st January, each community jackpot will escalate to a whopping £40,000! If you manage to win the Full House, you could take half the jackpot, and the rest will be shared with the other roomies. We want you to start the new year in style, so believe us you won't want to miss this! You can check the site for all the juicy jackpot details!